Regardless of your medical skill or technical know-how, removing the stitches from your dog is a relatively simple process. Even if you think that it would be safer to leave the stitches until your pet’s next check-up, it is actually better if you take the initiative and do it yourself. To help you through the process, listed below is a short guide on everything you need to know about removing stitches from your dog. What could happen if you leave the stiches in place? These symptoms indicate an infection or a graver complication. Immediately bring your pet to the veterinarian so that he can be properly assessed and treated. How can you remove stitches at home? Dogs can find it hard to stay still for long periods of time. Since removing stitches will take a while, it is best if you put a muzzle on your dog to keep him calm. Stroke his fur or give him a belly rub to make sure that he is fully relaxed before proceeding. Ask for assistance – to further lessen the chances of accidents or injury, ask another person to hold your pet down and keep him calm. Smaller animals can be held firmly under one arm with the head secured with a muzzle. Larger animals can be laid on their side and held down across the upper torso and neck. If the dog still continues to struggle, you can also hold down the lower legs yourself and have your assistant tighten their hold on the upper torso without choking the animal. Work swiftly but gently – using a pair of small and sharp scissors, cut the stitches one by one while making sure that you point the scissors away from your dog’s skin. 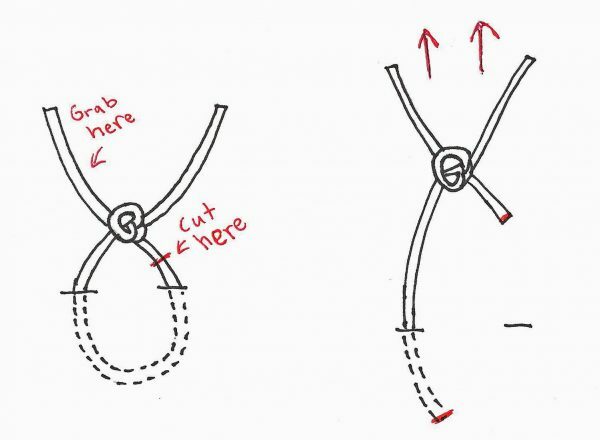 Repeat this on the remaining stitches until you finish. If the dog starts to struggle during this step, let your pet relax for a bit and continue once he has calmed down. Make sure that your pet is completely secured or muzzled before you start cutting again. Remove the sutures – once all of the separate knots have been cut, look for the end of the suture and gently pull it out. If the ends are too small to grasp with your fingers, you can also use a pair of tweezers. This process should be finished in one quick motion and your pet should not feel any pain. However, if he starts to yelp, stop pulling on the suture. It is possible that the skin may have already started to grow over the suture. In such cases, take your dog to the veterinarian so that he can finish this step instead. 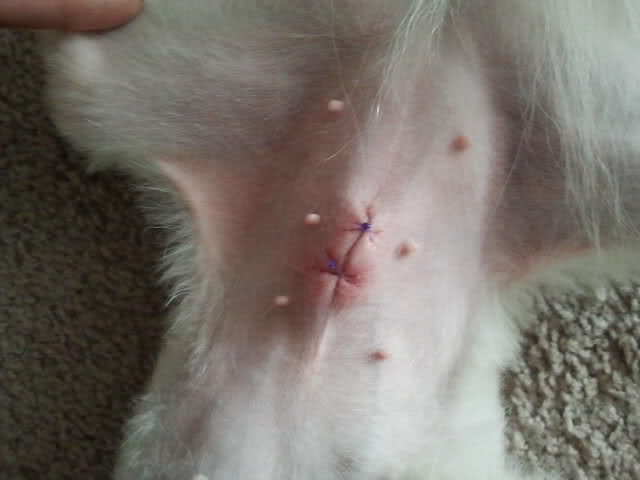 What needs to be done after the stitches are removed? Once the suture has been completely removed, clean the wound using a cotton ball dipped in warm water. Wipe away any dried blood or dirt from the incision to lessen the chances of infection. Do not use any alcohol-based solutions to clean the area since this can cause irritation and delay healing. Prevent licking – observe the wound for the next three days and clean it daily. While some people might say that your dog’s saliva can help the wound heal faster, the bacteria from your dog’s mouth can actually cause an infection. Instead, use an Elizabethan collar or an e-collar to prevent your pet from licking or biting the wound. Stop scratching – as the wound heals, the hair in the surrounding area can cause irritation and tempt your pet to scratch it. Scratching can cause the wound to reopen or cause infection. If the incision is located on their upper torsos, you can opt to have your pet wear soft shirts since the e-collar does very little to stop scratching. If the wound is located on the lower extremities such as the paws or legs, socks or soft shoes can also be worn. However, consult your vet beforehand since some vets might prefer that you keep the wound dry and exposed to the air. Lessen risks – undoubtedly, your dog is the biggest danger to himself when it comes to healing from serious injuries. As such, you should make sure that your pet is always supervised even when you are not at home. If there is no one at home that can make sure that your dog is not licking, biting, or scratching the wound, keep your pet in a crate or cage that can restrict his movement. Keep him away from other dogs as well since rough play can cause the wound to reopen. Limit his activity to short and relaxed walks and always keep him on a leash. 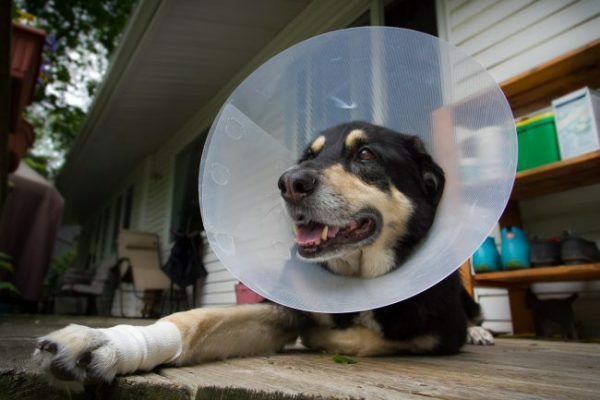 You can then let your pet go back to his usual routine once the wound has fully healed after 14 to 21 days. 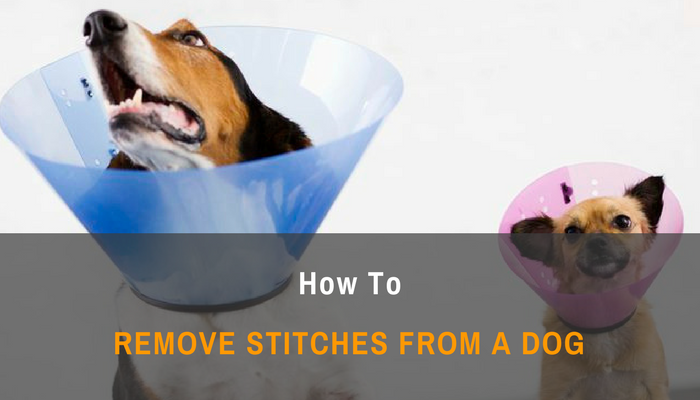 Ultimately, removing stitches is a process that will take a bit of patience, but barring any complications, it can still be done even without veterinary assistance. As long as both you and your pet are in a calm and relaxed state, you can easily take out the stitches and care for your pet in the comforts of your own home.